My grandfather, Paul Thornton, was a great lover of history. He had a copy of Charles Thornton Adams biography of Matthew Thornton and his family. Matthew Thornton was a doctor, soldier, statesman from the Colony and State of New Hampshire. This has always been a point of pride for our family, our connection to the American Revolution. I believe that the book may have originally belonged to my great grandfather John Clark Thornton, I have it now. He, John, is mentioned in the book as a descendant of Matthew's brother Samuel Thornton and he attended meetings of the Thornton Family Association in Boston along with his first cousin Dudley Clark Thornton. 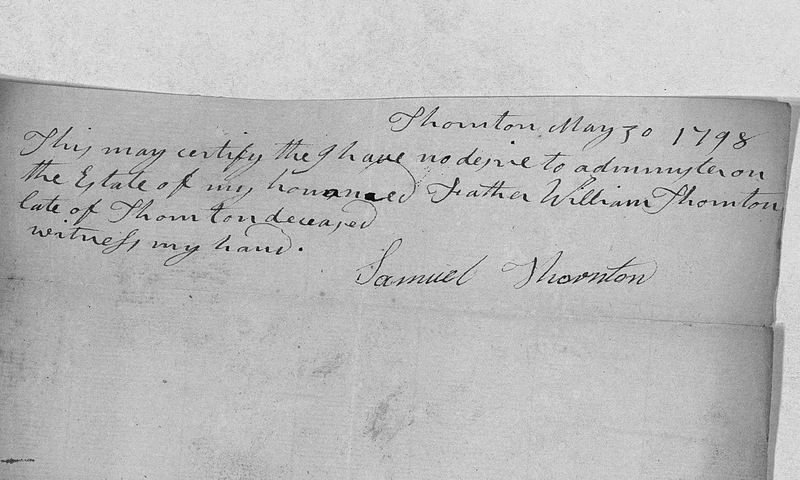 The Thornton line went from John to Samuel (3), Samuel (2), Samuel (1) to James Thornton, immigrant. Matthew, the third child of James and Elizabeth Thornton, is said to have been born in Ireland around 1714. Samuel was the sixth child and fifth son and is said to have been born after their immigration to the new world, 1720 is usually thrown out as the year of his birth. His place of birth is said to have been possibly in Wiscasett, Maine. His death too is uncertain said to be around 1798. A cloud of uncertainty seems to hang over Samuel, but my genealogy motto is; if it was easy, it wouldn't be any fun. I am gonna find this guy. Starting with the Adams manuscript, I know that Samuel was married twice and had 22 children, eleven by each wife. The names of his two wives are of course unknown as are the first set of eleven children. The second set of children are: Samuel (2), Reuben, Sarah, Abraham, Catherine, Dorcas, Eleanor, William, Sumner, Hannah and one unknown. Samuel was born in 1775 and Dorcas in 1779, both in Thornton, NH. The date of birth for the remainder of the children is not known. I know records are often missing or incomplete but how do two wives and 20 children disappear from any records. (FYI if you think Samuel Thornton married Mary Ann Craven in Maine, you are wrong. That marriage took place in 1878) So, the question is where to start looking for Samuel and his gang of offspring. If Samuel was born in America, then he must have spent the first twenty or so years of his life with his father. A search of the history of Pelham, founded by his father, shows that he was there at least until 1746, when the town paid him for some work he had done on it's behalf. That's all for Pelham. There is no record of a marriage or children taking place there. That doesn't mean it didn't happen, just that no record survives. Where to look next. Again, turning to the manuscript, Adams tells us that Samuel lived in both Campton, NH and Hatley, Stanstead, Quebec, Canada. I have read through the Campton, NH records and there is no Samuel paying taxes there prior to 1798. Hatley, Canada was founded sometime after 1790. In the book, "Forest and Clearings", a history of Stanstead and genealogy of the first settlers, there is no mention of Samuel. The land was covered by a vast forest and the work of turning it into farmland was arduous. If Samuel was an early settler in Hatley he would have been over 70 years old. This seems a bit much, even if he was in the best of health, for a man of his age. Geez, this is harder than I thought, Samuel (1) seems almost nonexistent and Samuel (2) seems to have sprung right out of the ground. A search of other family trees on Ancestry.com and other websites reveals that a large number of people seem to believe that Samuel (1) left New England for the South. Many trees have him in Abbeville, South Carolina married to a Mary Simonton. This Samuel died in July of 1797. Hum. Meanwhile, I decided to hook up with the DAR (Daughters of the American Revolution). In the process of looking for ancestors I have found a ton who have the qualifications for a DAR patriot. When I met with the Registrar I told her I wanted to use my ancestor Enoch Rowell as my patriot. After looking at my tree and at her DAR records she said, "nope it would be way easier to use SAMUEL THORNTON". What!!!! I mean, what does the DAR know about Samuel that I have been unable to find. That's it. I'm tired of Samuel (1), he doesn't play fair. I decide to concentrate on Samuel (2) and the rest of the Thorntons. I know that Samuel (2) and his wife Katherine Baker were married in Campton in 1802 according to the Adam's Manuscript. I search the 1800 federal census and there he is, living in Campton. Also in Campton is John Durgin, future husband of Samuel's sister Dorcas. Yea a small victory, but not much more. I decide to run down the Bakers, Katherine's folks. Katherine's father was Benjamin Baker. He and his brothers settled in Campton, NH after the war. His brother Moses Baker was a fairly well to do guy who was very involved in town business. Benjamin died in 1790 when Katherine was only 11. I checked the probate index to look for Benjamin and in doing so I noticed that a William Thornton of Thornton, NH also died in 1790. According to the index he left a widow and three small children under to age of 14. The names of the wife and children really caught my eye. They were: Abraham, Catherine, Sarah and Eleanor. Remember the list of Samuel's (1) children: Samuel, Reuben, Sarah, Abraham, Catherine, Dorcas, Eleanor, William, Sumner, Hannah and unknown. The wheels are churning now. What if Samuel and Dorcas were the children of this William as well. William was the forth son of James Thornton and if Matthew was born in 1714 then William was probably born around 1718-1722. He married in Pelham, MA and then moved his family to Dublin, NH. Supposedly the family left there because of Indian raids and joined his sister Agnes Thornton Wasson in Schenectady, NY. William and his wife, supposedly Dorcas Little (another name on my list), raised his first family in New York, their children included William Jr., John, Matthew, James, Molly and Thomas. William is also on the list of Samuel (1) supposed children. William (1) and his sons William (2) and Matthew returned to New Hampshire prior to the start of the American Revolution. His wife, Dorcas, died in 1763, and it seems he remarried either right before he left New York or just after he arrived in New Hampshire. I wrote a blog post about my theory that William might be the father of Samuel (2) and Dorcas, but I couldn't find any proof. Do I give up, no way, I am nothing if not dogged in my pursuit of father of Samuel (2), no way am I throwing in the towel on this one. So, last week there I was eating my lunch at work and doing a little ancestor digging as I munched through my Lean Cuisine. I was on famlysearch.org (great site if you know how to really use it) checking to see if I could find Samuel (1) probate records. I was looking at Grafton County and choose the records from 1798, the year many say he died. Gee, there's only 1100 pages of probate records to dig through, these record have not been indexed so it's a real slog to get through them. I start jumping through the records looking for the name Thornton and finally serendipity strikes. I click on a page and what jumps out at me, three signatures: Samuel Thornton, Dorcas Thornton and William Thornton. Well, well, well, what do we have here! This may certify that I have no desire to administer on the estate of my honored father, William Thornton witness my hand. Samuel Thornton. Yippee Ki-Yay! Samuel Thornton was the son of William Thornton. On another page the court records all the debts against William's estate, this is signed on the back by his heirs, William Jr, Samuel and Dorcas Thornton. Rather than be the end of this journey, it's only the beginning of another one, the pursuit of William Thornton. I can only hope he is as great a challenge than his brother Samuel. So what happened to Samuel, maybe he did end up in South Carolina. Are you a Thornton Cousin? I'd love to hear from you, I am working on a family tree of all the descendants of James Thornton.